At the beginning of August, a report from Canalys indicated that Huawei was on its way to take Apple’s title as the second largest smartphone brand in the world. Q2 of this year saw Huawei at 38 million shipments and Apple at 41 million, and just a little more than a month after those numbers came out, we can now officially say that Huawei has beaten Apple at its own game. 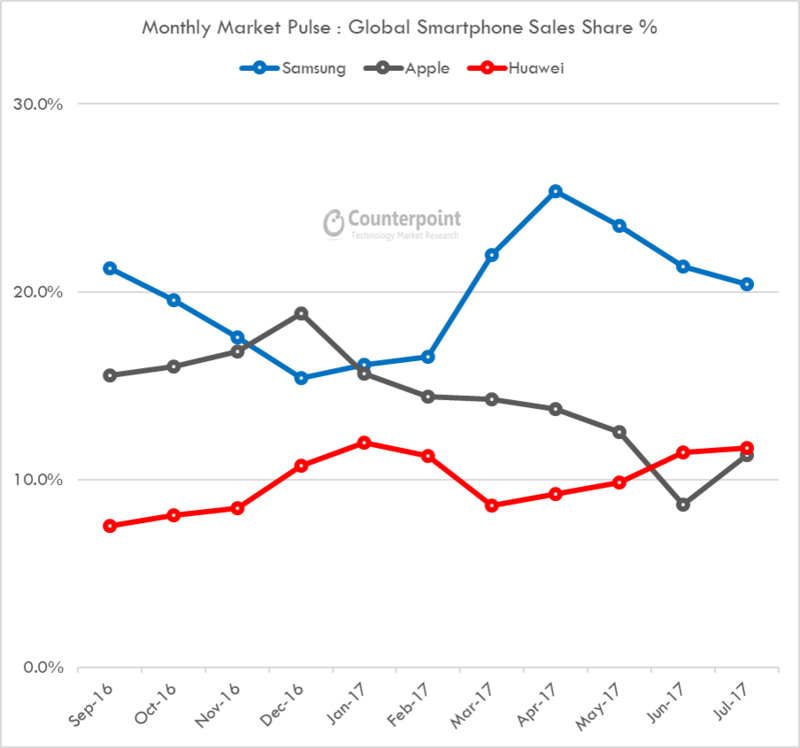 According to research conducted by Counterpoint, Huawei sold more devices than Apple for both June and July of this year. There aren’t currently any concrete numbers available for the company’s performance in August, but Huawei apparently saw strong numbers there as well. This is a significant milestone for Huawei, the largest Chinese smartphone brand with a growing global presence. It speaks volumes for this primarly network infrastrucutre vendor on how far it has grown in the consumer mobile handset space in the last three to four years. Richardson is on the money here. A few years back, the Huawei name didn’t mean much at all outside of China. However, with devices like the Mate 8, Mate 9, and the Honor 5X, 6X, and 8 from Huawei’s Honor sub-brand, the company has developed a considerably stronger presence throughout the United States, Europe, and various other markets. As for Huawei’s ability to overcome Apple during these summer months, part of this does have to be attributed to the anticipation surrounding the upcoming iPhone 8/Edition — whatever Apple decides to call its special 10th-year-anniversary device. Plenty of die-hard Apple fans are likely holding off on picking up a new iPhone with this year’s flagship just around the corner, but even so, Huawei’s achievement here is still more than commendable. Chinese brands are growing swiftly thanks not only to smartphone design, manufacturing capability and rich feature sets, but also by out-smarting and out-spending rivals in sales channels, go-to-market and marketing promotion strategies. Huawei’s next major flagship smartphone is expected to be the Mate 10, and considering how highly we praised the Mate 9 in our review last November, we’re anticipating a true beast of a smartphone when Huawei officially unveils the device on October 16. It remains to be seen if Huawei will be able to continue outselling Apple as we head into the last few months of 2017, but even with so much excitement surrounding Apple’s next iPhone, we wouldn’t count Huawei out just yet.